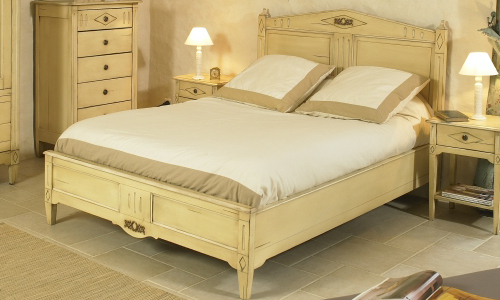 The Antoinette wooden bed encompasses a mixture of both elegant and traditional styling. Its design will fit with most decors in a bedroom both modern and traditional due to the Antique Distressed look. This effect is created by skilled craftsman. It is made from solid wood to ensure it has great strength and durability with beautiful hand carving both on the headboard and foot board. The headboard has a low curve incorporating a hand carved motif to give it that special finish. The bed base of the Antoinette Bed incorporates sprung Beachwood slats to give extra comfort and support for the mattress ensuring a comfortable nightï¿½s sleep. The bed is finished with clear lacquer to ensure that it is protected from stains and damages. The clear lacquer also enhances the colour and grain of the beautiful wood making it stand out as a centre piece in any bedroom either modern or contemporary.